It is safe to say the cryptocurrency industry would not be where it is today without the usage of Bitcoin in online gambling. While this may seem like a niche use case, numerous Bitcoin casinos have become wildly successful over the years. There is a massive amount of Bitcoin casinos and gambling platforms available to users. Below are the top 4 Bitcoin casinos for players to choose from. Further down in the post, you will also find a list of top bitcoin dice games which you should check out if you are looking for games with the lowest house edge. Note: Online gambling may be subject to legal restrictions in some parts of the world. One of the older Bitcoin casinos available today comes in the form of mBit. The company adheres to the gambling restrictions and requirements in Curacao, which also makes it a legal entity. Their main selling points include a growing variety of games, support for live dealers, and a hefty deposit bonus. However, it is worth noting mBit only accepts Bitcoin at this time, as the company has no plans to introduce altcoin support as of right now. That situation may come to change in the future, but for now, it will be all about Bitcoin. Another well-respected Bitcoin casino and gambling platform, Fortune Jack has built up a very solid reputation over the years. It too is regulated in Curacao, a region which seems to be rather friendly toward cryptocurrency gambling providers. With several hundred different game types to choose from, Fortune Jack caters to a very big audience. Moreover, the company supports altcoins such as Litecoin and Dogecoin, which makes it stand out from its competitors. By far considered to be the most popular Bitcoin Casino comes in the form of BitStarz. It too falls under Curacao jurisdiction, which is somewhat of a common trend among Bitcoin casinos and gambling companies. Over 1,000 different games are available for users, with more being added on a regular basis. The platform is also renowned for supporting altcoins , as well as more mainstream payment methods. This agnostic approach contributes to the company’s reputation and appeal. One major selling point of BitStarz is their customer support. Rather than just relying on a contact form of web-based chat, the team also frequents social media and even Reddit. While all other companies on this list also offer good customer support, it appears BitStarz goes well beyond the norm in this regard. This Bitcoin Casino has been around for a few years and has developed a reputation in the industry. The casino supports BTC, ETH, BCH, LTC and DOGE for its games. There are also various bonuses and cashback options, along with regular promos where one can receive free spins. The types of games supported by BitcoinCasino.us include High Roller, Jackpot games, Table Games, Roulette, Poker and Slot games. If you are not familiar with Bitcoin Casinos, they are websites just like any other gambling platforms but ones that accept cryptocurrency. In fact, many Bitcoin casinos only accept cryptocurrency as payment and it’s not possible to use fiat. By not dealing with fiat currencies, these platforms are able to provide faster cash outs, deposits, and make for a much more seamless experience. Furthermore, because cryptocurrency payments are irreversible, there is no need to wait for exhaustive KYC verification. Keep in mind that you might have to provide some identity verification in certain cases such as huge winnings, but 99% of the users don’t face any trouble. Current regulations in the US do not explicitly state that cryptocurrency gambling is illegal. While regular online gambling is regulated and is restricted for most states, current gambling laws haven’t quite caught up with cryptocurrency. There are only three states which allow for any type of gambling activity, online or offline. Those states are: Delaware, New Jersey, and Nevada. Some casinos play it safe and block any US IPs, but that doesn’t mean that cryptocurrency gambling is illegal in the United States. Are Bitcoin Casinos Provably Fair? A provably fair game is one where you can verify your bet against a third party to ensure that the casino didn’t tamper with the result. All the casinos mentioned above have a section for provably fair games. If you are paranoid about a Bitcoin casino cheating you out of your winnings you may decide to play those games where the bets can be easily verified. There are three main benefits to Bitcoin Casinos: Anonymity, Provability and Speed. When it comes to using a Bitcoin Casino you usually don’t have to disclose any personal information. 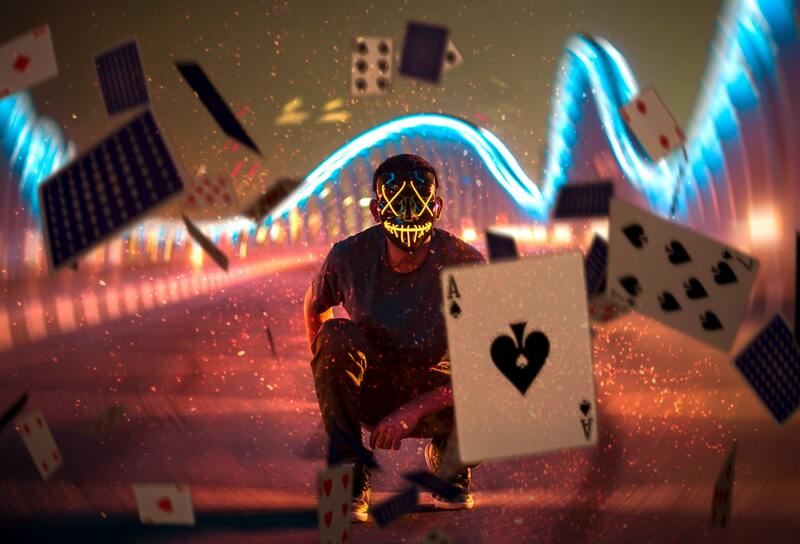 With regular online casinos, while you may not have to do any KYC, you end up providing them with your payment details which contain all of your personally identifiable information. The second main benefit of Bitcoin casinos is the option of playing provably fair games. That’s a trend that has started with crypto gambling businesses and one that ensures fairness. Last but not least, because crypto based online casinos only accept cryptocurrencies, cashouts are extremely fast and seamless. You don’t have to wait days for the money to arrive at your bank account and most cash outs happen within the hour. What Is the House Edge for Bitcoin Casinos? For the casinos mentioned above, the house edge ranges between 0.5% to 2% depending on the game you play. To put this in perspective, the house edge for slot machines in Las Vegas can be as high as 10%, poker has around a 5% house edge, depending on the variation you play. The house edge for Bitcoin casinos is quite low when compared to regular casinos. This is possible with the low overhead when it comes to handling payments. If these casinos used fiat there would be all sorts of fees involved in their operation such as deposit/withdrawal fees, bank fees, etc. What are Cryptocurrency Dice Games? You have heard us talking about bitcoin casinos, think of cryptocurrency dice games as a subsection of bitcoin casinos. Dice games are usually very simple odd based games. Most of the time they are dice games where you choose a number and roll the dice, if you get a favorable result you win, otherwise you lose. Most of the time the house edge is very small for dice games and there are a variety of options when it comes to the amount of risk you would like to take. Also, some dice games have an option to perform thousands of micro bets if you would like to try out some sort of strategy. Moreover, most – if not all – cryptocurrency dice games are provably fair. Meaning you can verify the validity and fairness of any bet to ensure that the house isn’t cheating you out of your winnings. If you are looking for a fun and interactive dice game, look no further! DuckDice.io is the hottest cryptocurrency dice game for 2019. With over 2 billion bets, and over 500 people online at one time this platform is proven to be a top option if you are looking to gamble a few satoshis. The interface is intuitive and you have a plethora of options when it comes to your bets. Furthermore, the house edge for the dice platform is only 1%, which is extremely conservative especially for a dice game. Another great bitcoin dice game is SafeDice. This one is just like DuckDice but the house edge is lower at 0.5%. Furthermore, just like with DuckDice you don’t need to create an account to start playing. In fact, there isn’t even an option to add an email if you wanted to! SafeDice is also extremely popular with over 200 million bets and over 100,000 BTC wagered, nothing compared to DuckDice but still very impressive stats. BitDice is another top cryptocurrency dice game. The main difference between BitDice and SafeDice / DuckDice is the fact that it offers other games besides dice. The other games that BitDice offers are quite unique, they are called: BitAces, Satoshi’s Secret, Blast Boom Bang and Money Farm. There is also the classic Black Jack and a variation of Texas Holdem if you are looking for the classic casino games. While BitDice is not as popular as the other two dice games mentioned above, it’s worth checking out if you are looking for something different. Crypto-games.net is a popular online casino that focuses on fast and simple games that everybody loves. Their bitcoin dice game is extremely popular with dozens of bets per second. Every single bet is provably fair and there are options for auto betting if you are looking to perform multiple micro bets instead of one large one. The dice game for Crypto-games.net has over 2 billion bets for bitcoin alone! There have been over 3.3 billion bets overall with 149 million in the past 30 days and 2.5 million in the past 24 hours alone. There is also a public chat where you can communicate with fellow traders.